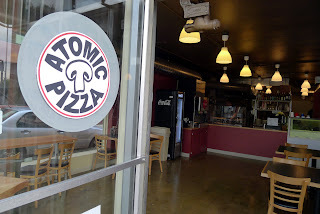 The recently opened Atomic Pizza in the Hollywood District is a nice addition to an area that is bustling with growth and activity. They've got great pizza and a rotating selection a craft beers pouring from five taps. They made add more. I stopped in not long after they opened a while back. This was based mostly on info from social media. They were pouring beers by Occidental, Breakside, Burnside, Ninkasi and Oakshire. They also have a small selection of bottles. Good stuff. What goes good with great beer? Great pizza, of course. 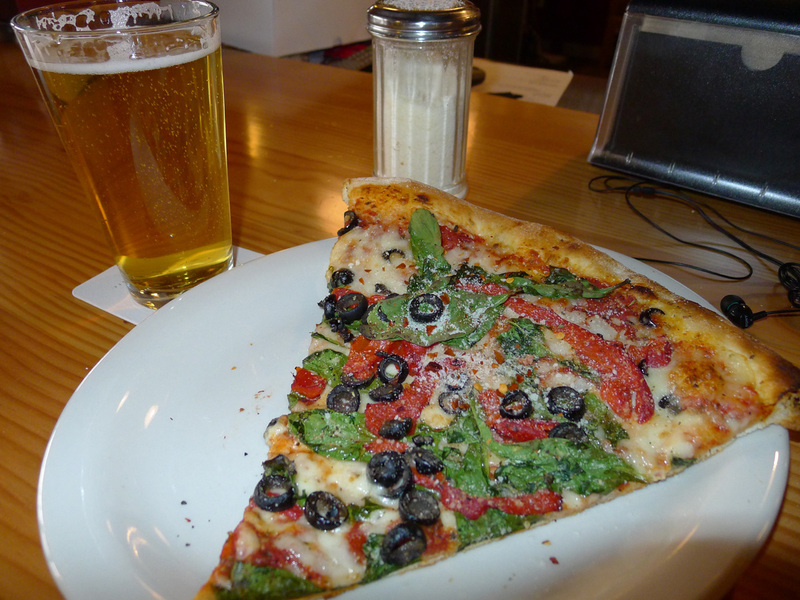 For me, great crust is the most important element of good pizza. Atomic has it. They make their own dough and the sauces are handmade, as well. When baked, the crust is crisp and crunchy without being too hard. I think it could use a bit more salt, but that's a personal preference easily addressed with a salt shaker after the fact. 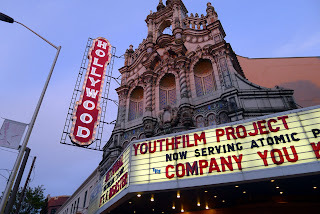 Another cool aspect of this place is its connection to the nearby Hollywood Theater. Folks who attend movies and other events at the theater can purchase Atomic Pizza via a pie hole in the main lobby. If you look at the sidewalk space between the two entities, you wouldn't think a connection possible. But this is an old building with catacomb-like passages. 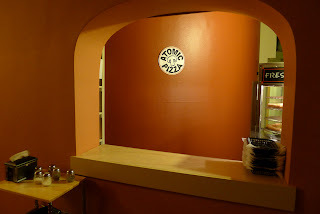 Atomic can't serve you a beer from the pie hole. No worries, though, because Hollywood Theater has a decent tap selection of its own. 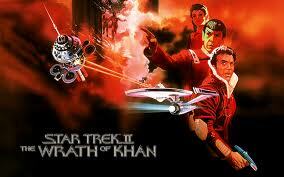 When I stopped in to watch The Wrath of Khan for the millionth time back in mid-April, the theater was pouring Occidental Kolsch and beers from Deschutes, Laurelwood, Ninkasi and Lagunitas. And Miller High Life by the (16 oz) can. It doesn't get much better. This area is undergoing a rejuvenation process. A long-empty space next to the theater is now filled with a new building. I believe these are apartments or condos with shops below. New businesses have opened along this strip and the amount of foot and bike traffic is amazing. I live close-by as the crow flies, so I'm happy to see this happening. 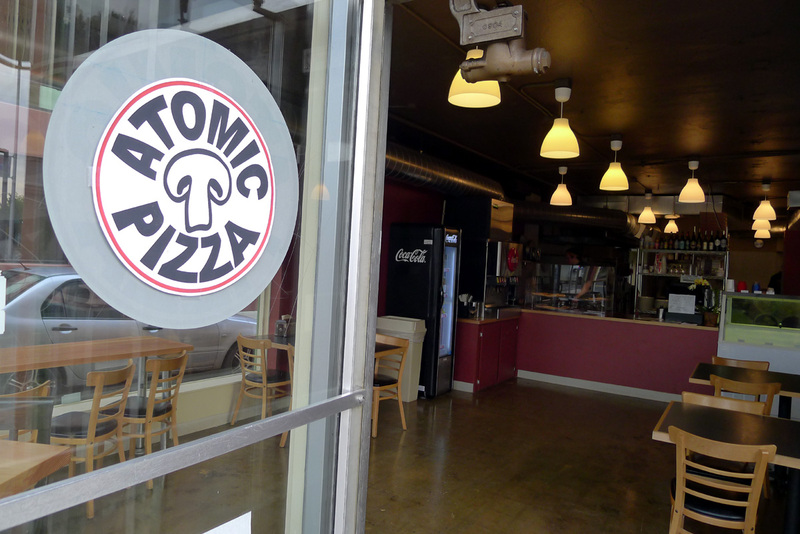 By the way, Atomic Pizza has another shop in the Overlook neighborhood on North Killingsworth St. That's actually their original store. I haven't been there, but I understand they offer the same selection of great pies and beers there. No theater, though, unfortunately. Speaking of the theater, this place has some history. It opened in 1926, smack dab in the middle of Prohibition and silent films. No beer or wine served then, folks. It was an odd setting for a theater, remote from downtown. In those days, Sandy Blvd. had streetcar and automobile access. It was considered a luxury theater. After difficult times in the 1970s, the theater was listed in the National Register of Historic Places in 1983. 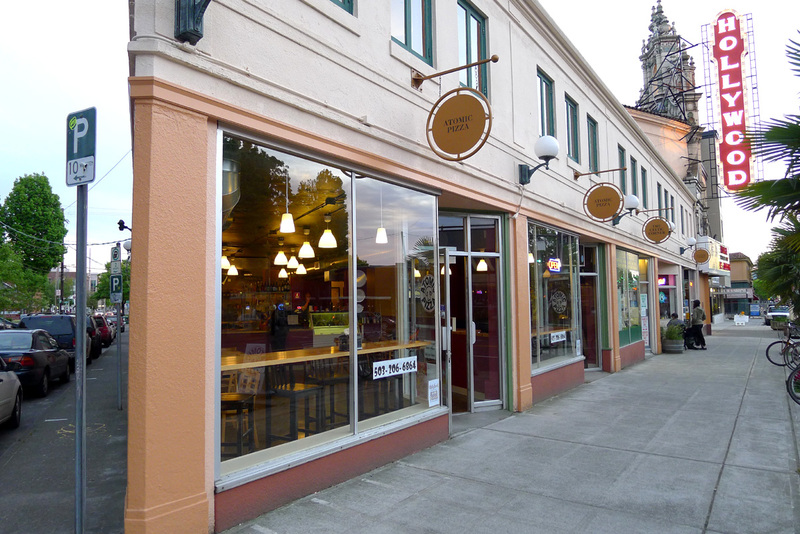 The non-profit group, Film Action Oregon, bought the place in 1997 and has worked to refurbish it ever since. Today, they screen films from all over the world and support Oregon-based independent film projects. Cool stuff. Part of the renewal project involved a fundraising campaign to purchase a new marquee for the old girl. That campaign exceeded its goal in late 2011 and the new marquee has been under construction. They hope to get it on the building by summer. More improvements are also planned and you can donate to the cause on their website here if you wish. Good times in the Hollywood District.